At Judy and Roy F’s house in Albany. At the New Concord Community Hall, 2689 County Route 9, East Chatham, NY. Hosted by Kristina K, et al. At Angelique W’s in Averill Park. NEWS 2019 returns to Northampton July 11-14 with workshops, tours and the marketplace. At Kaori O C’s in Averill Park. Join the Berkshire Hills & Dales Spinners for a fun Spin In event. Everyone welcome! For any questions, contact Michele. At Marietta M’s in Chatham. At Nancy R’s in West Sand Lake. At Grete R’s in Niskayuna. 7-7:30 pm is social time. Meeting starts promptly at 7:30 pm. Program: Barbara Decker will present a talk entitled Warp/Weave/Wear. beautiful clothes, blankets, and scarves. She mixes amazing colors and textures to produce original art. Barbara is also a member of our Guild and is a regular participant in the Show and Sale. I was honored to model one her sumptuous hand- dyed all silk rag jackets a couple of years ago. It was a joy to look at and to wear. Location: Calvary United Methodist Church, 16 Ridge Place, Latham NY. This will be a two day workshop on shadow weave. Those who attended her workshops last year know that she is a wonderful teacher and leads fun and informative workshops. The cost for this workshop will be $130, including a $10 deposit to hold your spot. Open to non-guild members (cost is $25 additional, which includes membership in the guild through May 2020). Please contact Mary Ellen S by email if you have any questions. Location: Albany, NY area (Niskayuna Fire District #2 firehouse). Gamps are such a wonderful way to study the interaction of color and weave effect. In this two-day workshop, which participants bring their own portable 4 or 8-shaft table or floor loom completely dressed and ready to throw the shuttle. - What is a gamp? The 4-shaft gamp requires 14-1/4” weaving width; 15-dent reed and three shuttles. The warp and weft are 10/2 pearl cotton (preferably UKI) in three colors of the weaver’s choice. The number of warp ends is 430 plus 2 for a floating selvedge at a suggested length of 3 yards. After washing, this will produce a runner approximately 12-3/4” x 60” plus more for an additional table scarf or samples. The 8-shaft gamp requires 24” weaving width; 12-dent reed and two shuttles and five bobbins. The warp and weft are 8/2 Egyptian cotton in five colors of the weaver’s choice. The number of warp ends is 489 at a suggested length of 3 yards. After washing, this will produce a hemmed runner approximately 17-3/4” x 60” plus more for an additional table scarf or samples. Susan Conover will teach a one day workshop on spinning on the great wheel. There will be some great wheels available if you do not have one (on a first come basis). The cost for this workshop will be $65, including a $10 dollar deposit to hold your place. Open to non-guild members (cost is $25 additional, which includes membership in the guild through May 2020). Email Mary Ellen S to reserve your spot. Location: Albany, NY area (Niskayuna Fire District #2 firehouse). Susan Conover began spinning and weaving in 1980 and spent the next three decades studying under numerous international teachers. Her focus has always been on the historic aspects of the craft. Since 2000 she has offered courses in spinning and weaving from her studio. It is a premiere teaching environment with six Schacht Equipment floor looms and a “herd” of Schacht and Louet spinning wheels. Her expertise has included being Operations Manager at Vavstuga Weaving School in Shelburne Falls, MA for five years. She specializes in lectures and workshops for guilds and craft schools throughout the country. Susan currently operates out of a newly remodeled studio that augments the original Schacht and Louet equipment with ten Glimakra countermarch and counterbalance looms. She offers two to five-day workshops in her home studio and hosts students from throughout North America. Beginning in early Spring of 2017 Susan enrolled in the Olds College (Alberta, Canada) Master Weavers Program. She is planning to complete the five-years of study by 2021. Susan has provided workshops previously for the HWMG and received universally positive feedback from the attendees. We are thrilled to have her back. 7-7:30 pm is social time. Meeting starts promptly at 7:30 pm. Program: Mini-workshop night! Four concurrent workshops to choose from. • Cecelia Fritelli will share her nifty, quick one-handed method for tying on a new warp to a dummy warp. When you tie on, you utilize the threading and sleying of the previous project. Once you develop speed and accuracy, tying on can save time, especially with complicated weave structures. It also conserves expensive materials, like silk. warps and can be helpful with color and weave structures such as log cabin and shadow weave. • Connie LaPorto will teach basic Kumihimo, a Japanese braiding technique. and how to interpret vintage overshot patterns for modern use. 7-7:30 pm is social time. Meeting starts promptly at 7:30 pm. Program: Review of Guatemalan weaving exhibit at Schweinfurth Art Center. Also, scarf challenge! Put 8 oz of the fiber of your choice into a bag. Mark fiber content on bag. Pick a bag and weave a scarf (or something else) using the fiber in your chosen bag. 7-7:30 pm is social time. Meeting starts promptly at 7:30 pm. Program: Bucket auction! Time to clean out your studio and closets of any unwanted fiber related items such as yarn, equipment, fabric and donate them for the auctions. You will receive 2 tickets for each donated item, and can purchase additional tickets [$1 each, 6 for $5] at the meeting. Of course, you do not have to bring something in to participate. For those who may be unfamiliar with a bucket auction: a cup is placed by each donated item. Participants put a ticket [or more than one ticket] in the cup for the item of which they would like to bid, then a ticket is drawn from each cup to determine the winner of the item. All proceeds go to the guild. An event 40 years in the making! 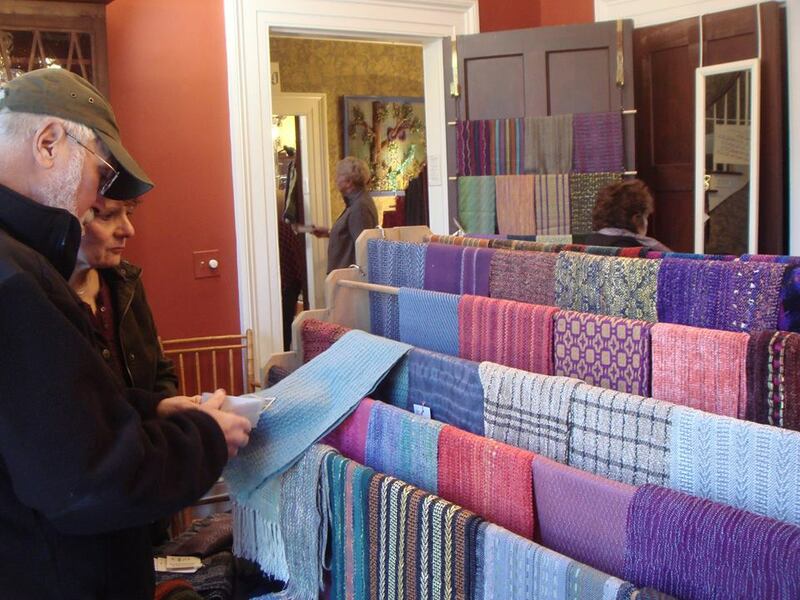 The Hudson-Mohawk Weavers’ Guild invites the public to its 40th Annual Show & Sale. At the historic Pruyn House, 207 Old Niskayuna Rd, Colonie. Handwoven fashions, furnishings and holiday gifts, all made by local artisans. Fashion shows (Thu at 7 pm, Fri-Sat-Sun at 2 pm), weaving and spinning demos. Free admission and parking. Click for more info. 7-7:30 pm is social time. Meeting starts promptly at 7:30 pm. Program: Bob Gardner will speak about chair caning and woven seat repair. He enjoys speaking about, repairing and restoring chairs with cane, splint and rush seats. Great smaller show in West Springfield, MA. All indoors! Website. Day guild meeting at Grete R’s house. Labeling party for S&S postcards. Those in the know just call this “Rhinebeck” after the town it’s in. The NY State Sheep & Wool Festival is one of the largest such festivals in the country, and people come from all across the US and even the world to attend. 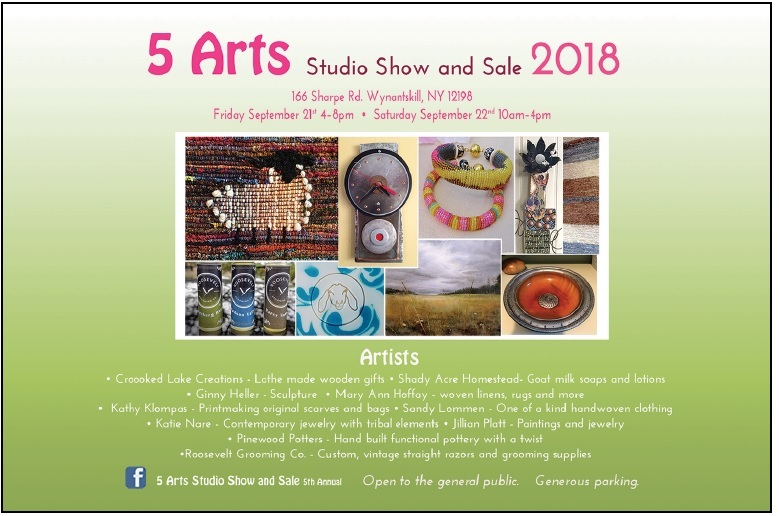 Several Guild members will be exhibiting at this event. Social time starts at 7 pm. Program starts at 7:30. Program: Tegan Frisino will talk about a workshop she took with Daryl Lancaster on sewing garments with handwovens. Lancaster is a handweaver and fiber artist known for her award-winning handwoven clothing. She has been constructing garments for more than 45 years. Do you know your fibers? Whether from animal or vegetal origin, fibers and textiles have been an important part of our lives since the dawn of history. Processed into yarns and threads, dyed, woven, they have always had a utilitarian purpose, as well as social importance. Fabulous Fiber Arts weekend at The Farmers’ Museum will explore the world of natural fibers through a variety of demonstrations, mini-exhibits, hands-on activities, showing how they are harvested, processed, and transformed into wearable, utilitarian and decorative items. Come see museum interpreters and local quilting and spinning clubs and guilds demonstrate how flax becomes linen, wool and cotton is spun on various spinning wheels, and produces textiles on looms or through needle arts. You will never think of your clothes in the same way again! Fabulous Fiber Arts is included with regular paid admission. $12 adults (13-64), $10.50 seniors (65+), $6 juniors (7-12), children 6 and younger and members are free. Day guild meeting at Anna B’s house. The place to find the best locally made Yarns - Crafts - Arts & More! Used Equipment Auction - Fleece Show and Sale - Skein Show. Sheep herding and shearing demonstration sheep, rabbits, alpacas, and angora and cashmere goats. Over one hundred artisans and craftspeople. Festival foods and craft beverages. Roving, fleece, yarn, patterns, kits, pottery, paper crafts, healing arts, all natural body care products, wood crafts, and more. Free pony rides, wagon rides, and pumpkin decorating for kids with paid adult admission. 166 Sharpe Road, Wynantskil NY. Many different artists. Open to the general public. No admission fee, plenty of parking. The first dye day will be held September 15th at Grete R's house. We will have 2 sessions; 9:00 - 11:30 and 12:30 - 3:00, with a potluck lunch from 11:30 - 12:30. We will be painting warps or skeins using synthetic dyes. We will not be doing immersion dyeing. Participants will need to bring either a pre-wound warp [maximum length of 10 yards] or a tied hank of yarn to be dyed, your choice of either cellulose fiber [cotton, rayon or tencel] or protein fiber [wool or silk]. The cost of the workshop is $10 to cover the cost of supplies. You will be able to soak your yarn in the appropriate solution at the workshop before dying. Space is limited so we will only have 10 participants in each session. If you have any questions, please call Mary Ellen S 518-813-5519 or Grete R 518-374-3132. Sign up using attached form. Program: Pricing of handwovens. Social time starts at 7 pm. Meeting starts promptly at 7:30. Day Guild meeting at Jan B's in North Greenbush. Starts at 10 am. Guild picnic at Sandy L's house in Wynantskill. Please bring a chair and a dish to share! At Mary Ellen S' house. Program: Guild member Lily March will present her doctoral research on legendary knitter Elizabeth Zimmerman. Bring or wear any Elizabeth Zimmerman designs you have. The guild challenge (weave something adapted from or inspired by something in an old weaving magazine) is also due at the May meeting. Bring your challenge piece for Show & Tell. Social time starts at 7 pm. Meeting starts promptly at 7:30.